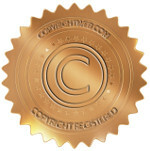 Description content for this Copyright: Designed by Dr Marc Miller Bay logo for dental marketing. Logo is also in multiple other colors and backgrounds. Description content for this Copyright: A Modern Fiction story about a man, Charles Smith, who assassinates the President of the United States of America.